Jon Pestoni, Shelf Life, 2012, oil on canvas, 103 x 78 x 2 1/4". 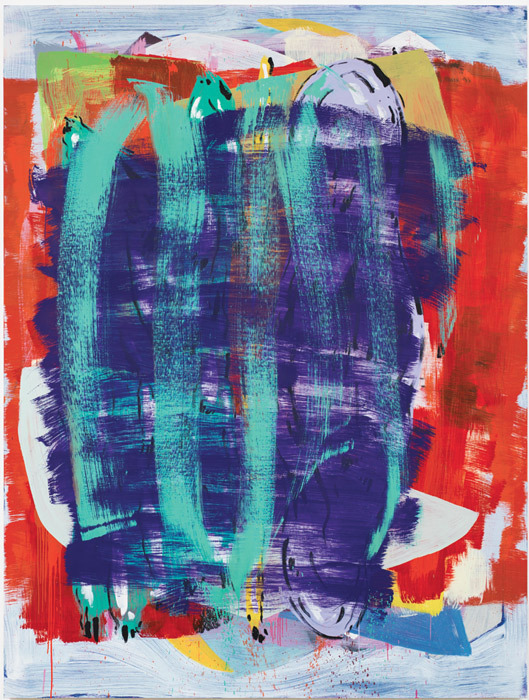 Although this first hometown solo show by artist Jon Pestoni was ostensibly an exhibition of formally motivated abstract compositions, the broad swaths of bold, often dry-brushed color that were characteristic of its seventeen medium- to large-scale paintings in fact served to physically frame a literal second layer of meaning beneath. For those who have followed Pestoni’s practice closely, these glimpses of figuration call to mind his earlier, rarely exhibited workpaintings that narratively address a rupture in Pestoni’s personal life, which, like the canvases, he chose to keep relatively private.